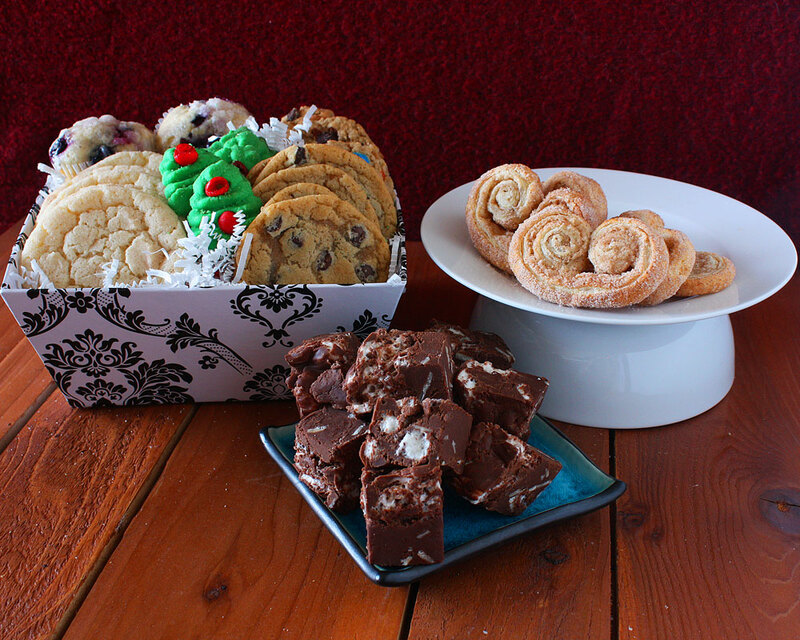 We are firm believers that fresh baked treats make the best gifts. From small gifts to large ones, let us help you make a statement! 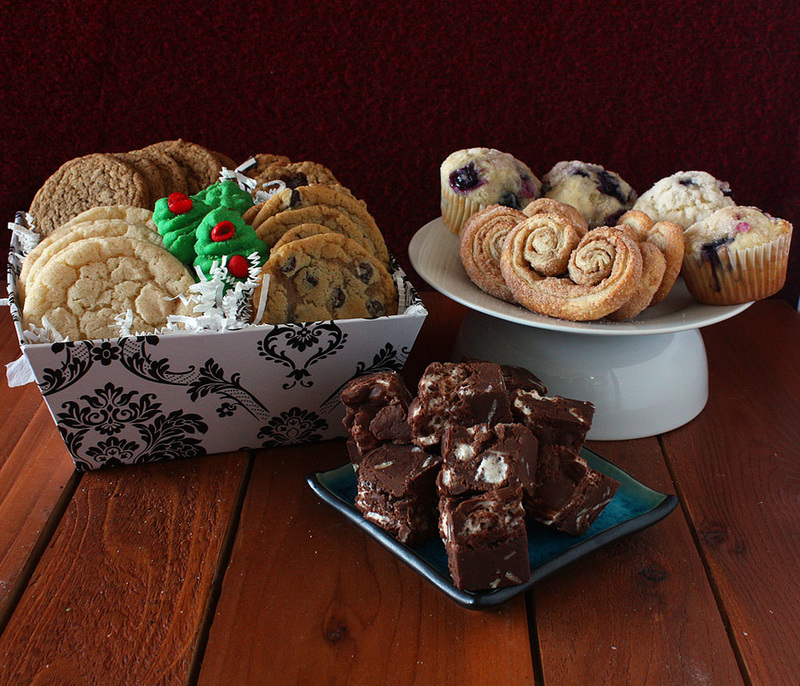 One of our vendors sent us a beautiful gift basket from Whipped Bakery for the Holidays. It is incredible – filled with such an attractive, not to mention such DELICIOUS, assortment of goodies. I just wanted you to know that the people in our office are enjoying every bite! What a quality product you provide! I’m definitely keeping your business card!! -Janet G.
Available in November and December. Please scroll down for basket options the rest of the year. Thanks! Are you looking for a great way to show your love or appreciation this holiday season? 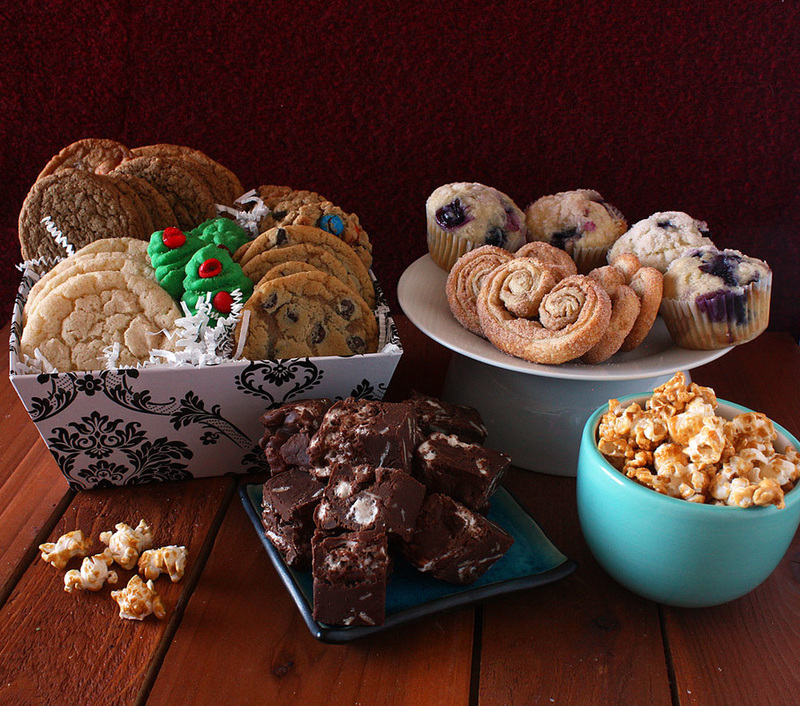 Try one of our hand-crafted gift baskets. Whether you're saying thank you or I love you to a friend, family member, client, colleague, or hostess, say it with Whipped Bakery. 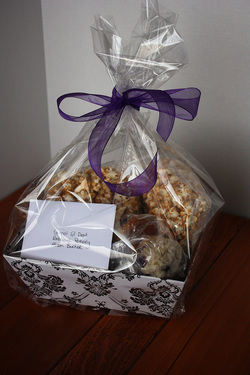 All of the items in our gift baskets are made and packaged by Whipped Bakery. Please see below for shipping and delivery details. *Palmiers are cinnamon sugar pastries, also known as elephant ears. Are you looking for something a little simpler but still stunning? 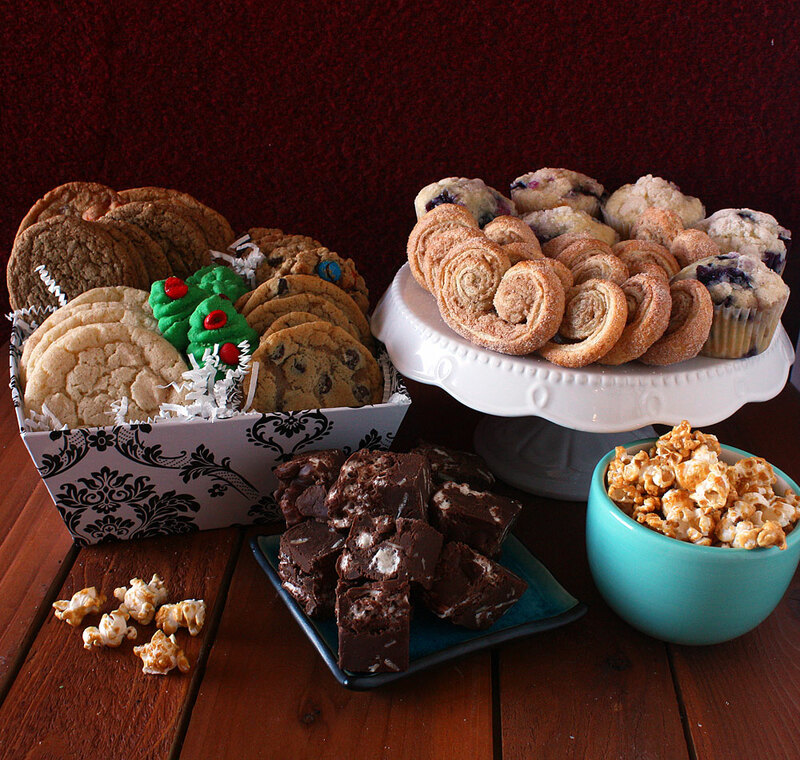 Perhaps you are looking for something to bring to a holiday party or to give as a hostess gift. Check out our variety of tins. Please see below for shipping and delivery details. Sometimes all you need is a treat tower. Simply stunning and filled to the brim with hand-crafted treats, these towers are sure to impress! Please see below for shipping and delivery details. 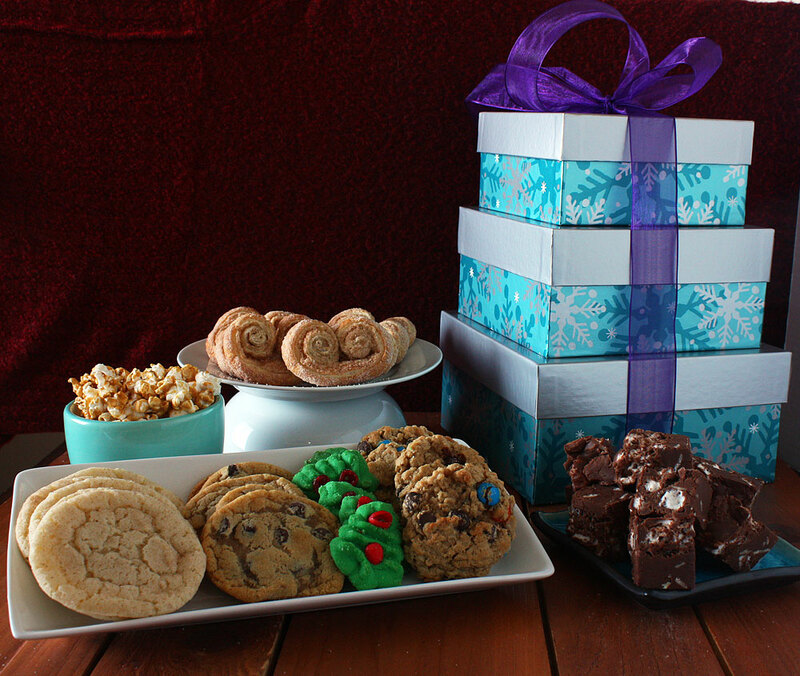 The bottom box contains three types of cookies, middle box contains caramel corn, and the top box contains fudge bricks. Each box is filled to the brim. 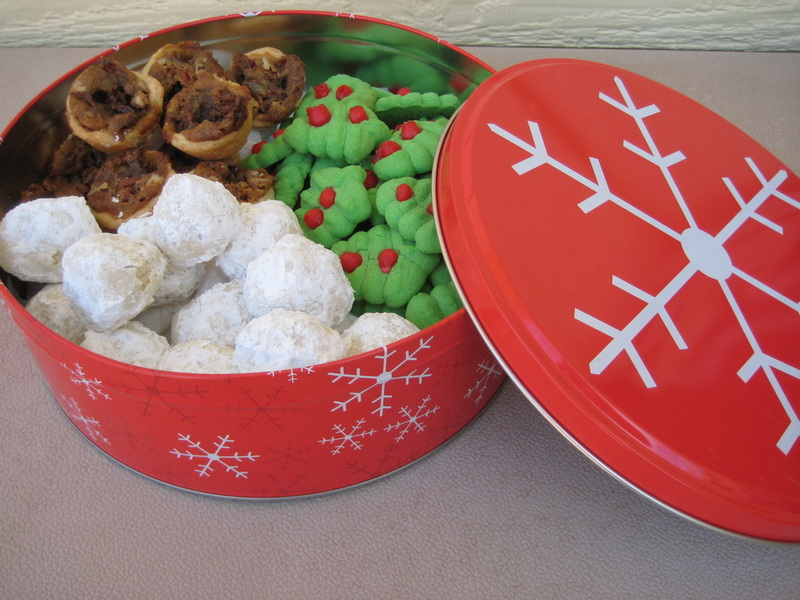 The bottom box contains four types of cookies, middle box contains caramel corn, and the top box contains fudge bricks and palmiers*. Each box is filled to the brim. We are happy to deliver to you or to the recipient. Delivery is $25 for the first 15 miles and 54 cents/mile round trip after that. Delivery is free within Roxborough. Want to see how far you are from Roxborough? Click here and enter your address on the left in the B space. Please remember that it's a round trip fee. We also can ship. To get you a shipping estimate, we need the recipient's zip code as well as which items you want to send them. We ship either priority mail USPS or two-day FedEx. Already have a FedEx account? We are happy to ship using your account number. Give one of our gift baskets to show your appreciation! We have three sizes for you to choose from, and we can customize them for you. If you'd like to create your own basket using our menu of items, let us know what you want in it and we can give you availability, pricing, and suggestions.